Ken Gutterson (front, far right) and the Cordelta team. Local professional services firm Cordelta, named in the top 10 best places to work in Australia for two consecutive years, has moved into a trendy new office in Fyshwick to accommodate its expanding team. The company, which started with just three people in 2004, now has a workforce of more than 80 that supports a growing number of government departments and private sector clients with a wide range of management, technology and people services. Ken Gutterson, Cordelta co-founder and Managing Director, attributes its success to a blend of unique philosophies on managing clients and caring for employees and the broader community. 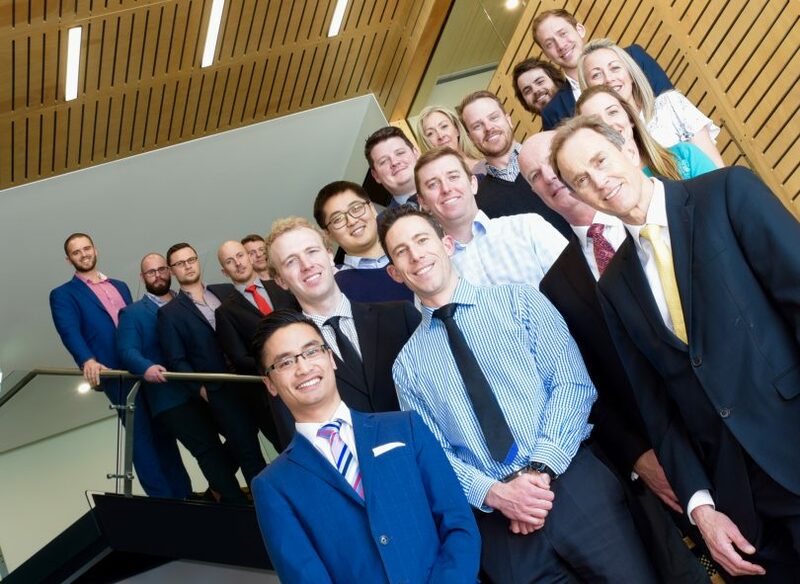 The Cordelta model has allowed the company to scale significantly over the past 13 years, creating hundreds of jobs for Canberrans in roles such as strategy and planning, business transformation, project services, procurement, finance and accounting, and technology and security. A separate arm of the business, MTP Services, offers recruitment and contracting services. The founding partners’ philosophies on people management (their own in particular) have made headlines, securing them a top ten ranking on the BRW Best Places to Work in Australia survey two years in a row. Ken says that Cordelta is always looking to recruit new staff that are passionate and can truly see the value in what they do. And support they do, organising and funding annual getaways for employees and their families at a holiday resort, to say thank you for their efforts. In previous years, they’ve gone to Thredbo, Luna Park and the Blue Mountains. Next year’s trip will be to one of the best hotels on the NSW South Coast. Of building a business in the Territory, Ken says that he sees a strong future in the ACT economy and is proud to be part of it. “Canberra has been very good to us, and we don’t see the business environment slowing down anytime soon. I love living here, and as an organisation we give back as much as we can by supporting local organisations such as soccer clubs, OzHarvest, Vinnies and many others. For more information about Cordelta, or to submit your interest in joining the team, visit Cordelta.